Who is possessed? Thing? or Me? When I visited my parents in January of this year, I re-experienced my childhood home: wall to wall stuff. My mother has at least 25 doll tea sets on display in a variety of rooms. She has dozens of quilts, many hand-made, artfully draped over various chairs, railings, benches and beds, peeking out of cabinets, folded across footstools. Every horizontal surface has groupings of nicknacks, doll tableaux, candle groupings, caroler figurines, primitive tin sculptures balancing and swaying above counterweights, and so on. There are year-round fully decorated artificial Christmas trees in several rooms. My former bedroom is now home to hundreds of dolls, antique and “country,” baby dolls and display dolls. Despite this (and the single bed), when my partner & I chose to stay in a B&B, my parents were surprised. I love many of my mother’s things. She has a set of blue onion pattern dishes that I adore. She has beautiful canisters to match–including many that are duplicates. She has another set of red transfer-ware English Ironstone china that I love, too. And yet another set of ironstone with a tiny blue clover pattern. I have long coveted a quilting-frame that I saw there many years ago, but which seems to have moved into an attic. But it’s just much, too much. One can barely move for the number of objects carefully posed around one’s body. Many of her things have been acquired since I moved away and I have no personal attachment to them, although I appreciate their beauty. Where once, Mom collected bona fide antiques, she’s moved a significant degree towards the kitschy “country” or “shabby chic” end of the decorating scale. These things are simulacra: they pretend to be “collectors items,” but the carolers are molded plastic, the tin balancers are made in China; the rust and patina on most items aren’t from age and use, they’re the result of chemical treatments. My dad has little to no say or influence — home decorating is my mom’s realm. 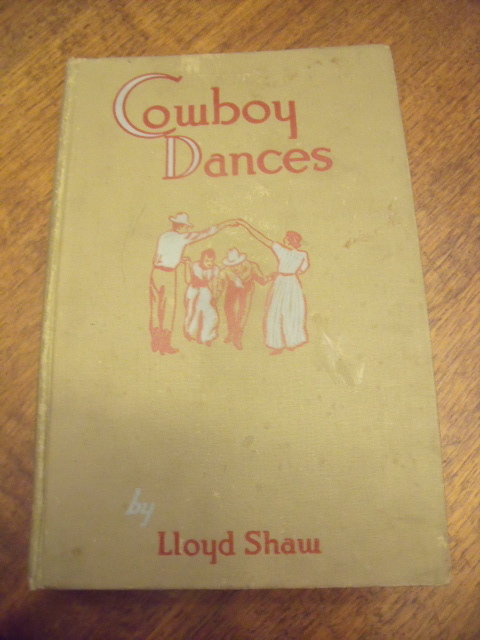 I don’t remember “Cowboy Dances,” however — or perhaps only dimly as something I saw in the back of the coat closet, where a heap of my dad’s possessions were stashed. Also back there behind the winter coats were some disused instruments, a hat box full of his ribbons and trophies from horse show days, and his band jackets — the flashy sports coats that he and his band-mates wore to play music. “Are you playing tonight, Dad?” was the usual question when my dad returned from his day job, delivering heating oil. More often than not, he was: for a wedding, a dinner, a country club event, a reception, a rehearsal. In the summer, “The Top Tones,” as I knew his band, played at outdoor family reunions and on the Music Pier in Ocean City and at yacht clubs events and at band shells in the park. And it was my dad’s band, he was the headliner and the lead singer. He didn’t sing like Mel Torme, but he was a funny, extroverted, lively guy who could sing thousands of songs. He played the guitar by ear, without formal musical training. He held the group together from grammar school days until each of the guys died from the various diseases of old age: drummer, saxophonist, steel guitar player, and bassist. But before I had reached the age of awareness, the band was called “The Top Railers,” and the repertoire was a lot more to the country-western end of the scale. Was this book perhaps originally my dad’s? 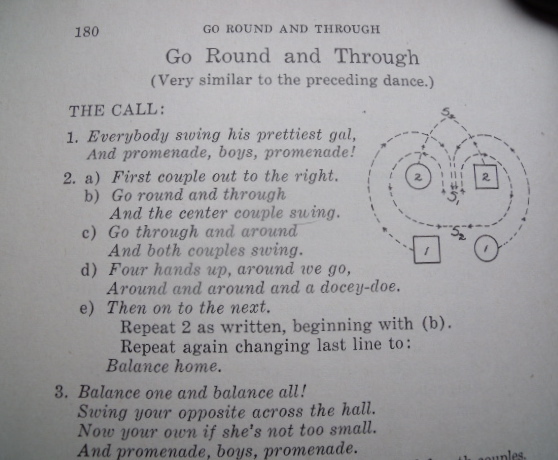 Perhaps once, he dreamed of being a square-dance caller and sought to learn through this book. Save or toss? 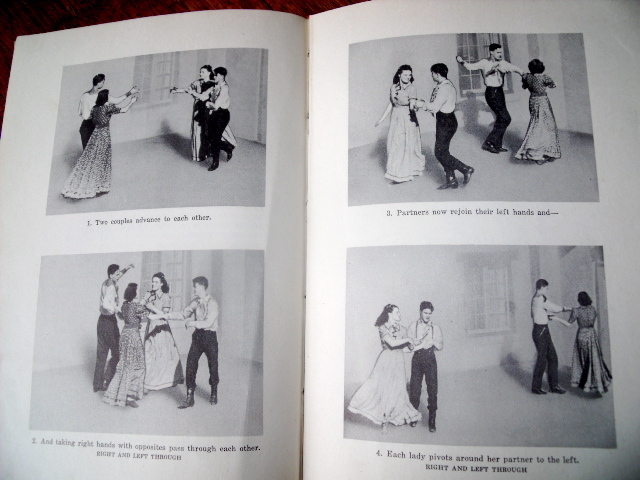 “Cowboy Dances” presents me with yet another conundrum. Posted 5 years ago by deendeens.